The M. W. Dunton Company, Inc. The History of the M.W. Dunton Company. 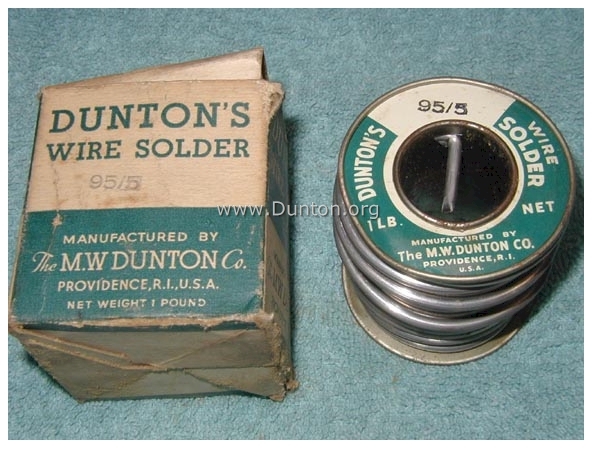 The M. W. Dunton Company specialized in soldering products "for almost 100 years." The company was taken over and merged into the RectorSeal Company in 1998. Please Note: This is a family history site. We are not associated with the company, which in fact was purchased in 1998 by RectorSeal. See below for more information. The following are images that are either in our archive or have been offered for sale on the internet. Information about this company is scarce and everything that we know is listed on this page. If you are a researcher and have information to share, please contact us at . The directions are on the side. Measures 1-1/2" high by 2" in diameter. 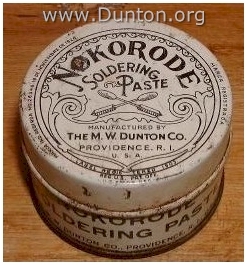 NOKORODE Soldering Paste - "THE ORIGINAL"
Manufactured by the M. W. DUNTON CO. of West Warwick, R.I. 02983. Known world wide! Registered in 1903! "MARCA REGISTRADA NO. 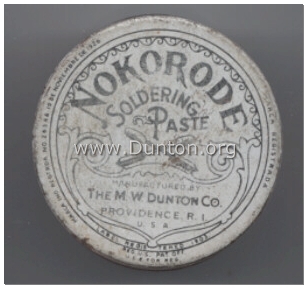 26346 -19 DE NOVEMBRE DE 1926"
The M. W. Dunton Co. Nokorode Soldering Paste print advertisement that ran in the publication entitled "Hardware Age," in the December 16, 1920 issue. A brochure and samples for M.W. 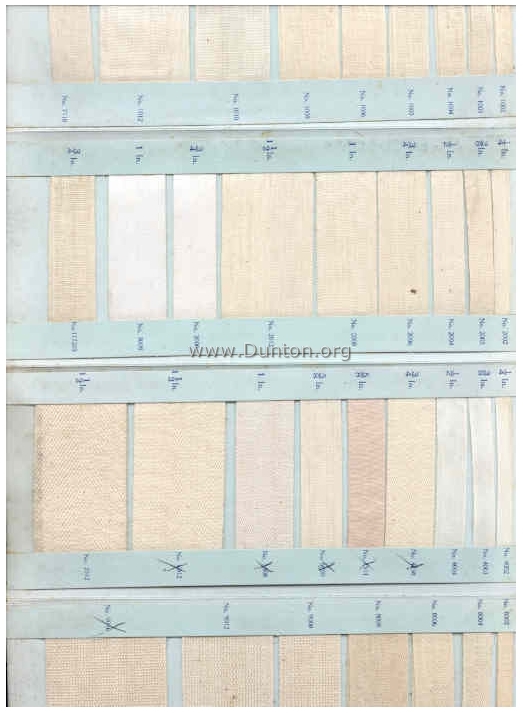 Dunton's "Armature and Field Tapes." The bottle stands five inches tall to the top of the cap. 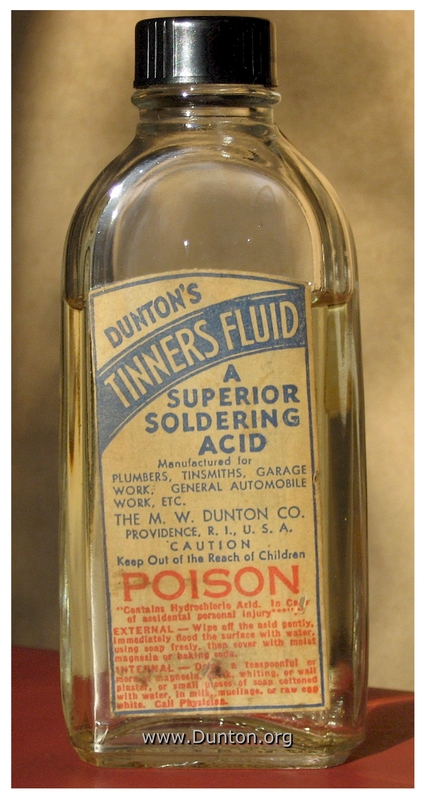 The label reads, "DUNTON'S TINNERS FLUID" and has a prominent "POISON" warning printed in red. 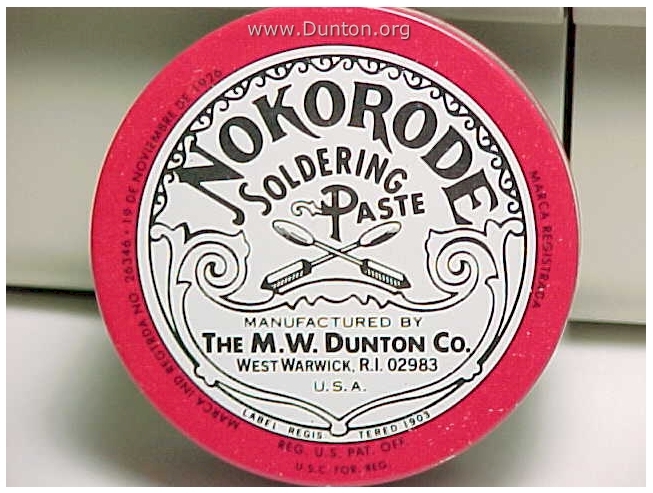 The fluid was described as being, "A superior soldering acid manufactured for plumbers, tinsmiths, garage work, general automotive work, etc." 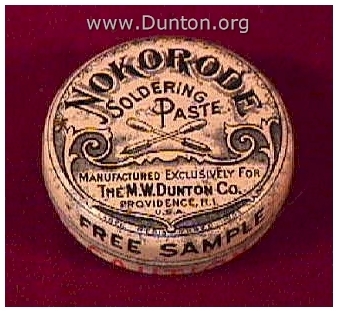 The M. W. DUNTON CO. PROVIDENCE, R.I., U.S.A.
Small Tin of Nokorode Soldering Paste is marked "Free Sample". Made by the M W Dunton Co., Providence, R.I. Approximately 1-3/8 inches across. 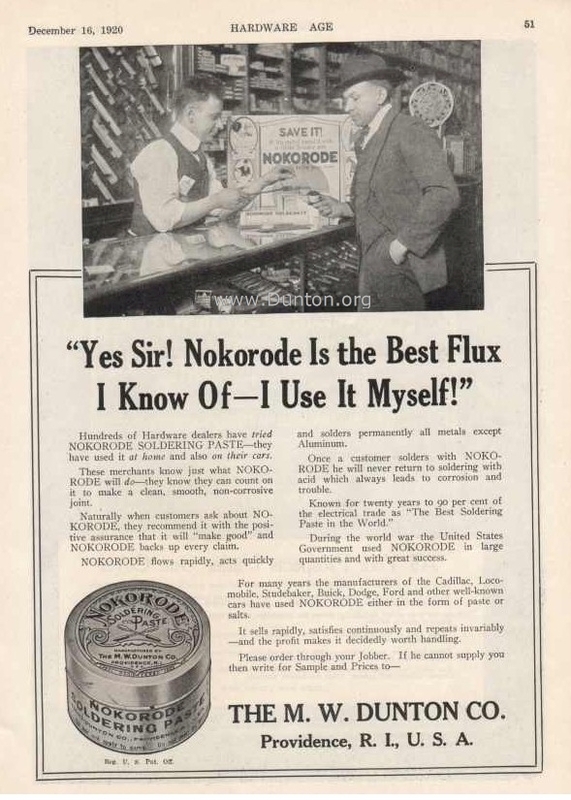 "Soldering Kinks," �1917. A book on soldering tips, techniques and projects in PDF file formation. Note: Right-click on the links and select "Save-As" to download a copy.